As for the glasses... glass or metal. The official glasses have different images each year, but always on the back is the winners list. The silver julep cup is from the Kentucky Colonels - and yes it's not just Col. Sanders who started Kentucky Fried Chicken - but an association where two members have to sign the application then it has to be accepted by the Governor. 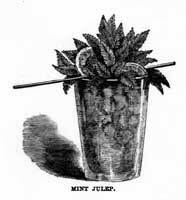 “I must descant a little upon the mint julep, as it is, with the thermometer at 100, one of the most delightful and insinuating potations that ever was invented, and may be drunk with equal satisfaction when the thermometer is as low as 70. There are many varieties, such as those composed of claret, Madeira, &c.; but the ingredients of the real mint julep are as follows. I learned how to make them, and succeeded pretty well. If that don't mean mint-julep, I don't know the English language." "Ice is everywhere. The first thing in the summer morning in Virginia is an immense mint julep sparkling with ice. It is passed from hand to hand, and lip to lip. I remember well the first time I was offered this social glass. It was by President Tyler [1841-45]. It had been brought to him early in the morning. He drank a little, smacked his lips, and handed it to me. I had never been initiated into the Virginia custom. I had no objection to a mint-julep,—rather the contrary—but had been accustomed to have a moderately sized tumbler all to myself, and never to share in one of whatever Brobdignagian proportions. So I politely declined; but the handsome daughter of one of the cabinet ministers, coming in at that moment, took the glass, drank the president's good health, and passed it on, until it made the round of the presidential party."